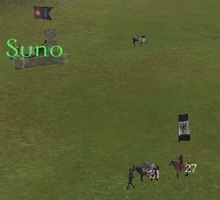 Mount&Blade's gameplay centers around a world map. The map shows the entirety of the game world, and features visual representations of different structures and terrain features. Parties are represented by single figures, and move around the map in real time. Time pauses whenever your party is stationary or engaged in combat; when stationary you can manually advance time by holding Space. The primary control for the world map is to move your party and the direction keys (WASD) to move the camera. You can also zoom in and out using , and you can rotate the camera by touching the mouse cursor to the left or right edge. Structures and parties on the world map can be interacted with by travelling to them using . If the party is friendly or neutral you can talk to them, but if they are hostile they will try to fight you. Hostile parties smaller than your own will run from you while those larger than yours will chase you. 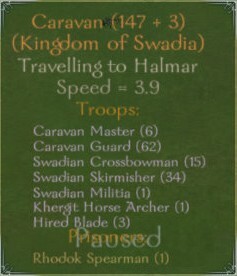 Enemy trade caravans are passive and will never attack you. Each party has a label showing how many troops are in that party (numbers shown after a "+" are prisoners). Each faction has a distinctive color that is used for the labels of all their parties and properties. Parties that have no faction have white labels, as does yours (even after you have joined a faction). Hovering the mouse cursor over a party or location will show you the forces it has (if any), as well as the faction it belongs to. Hero names are listed with their health as a percentage in parentheses. Troop quantities are also listed in parentheses, but wounded troops are counted separately after a forward slash (/) to indicate that they are present but unfit for combat. At the very bottom of the pop-up is a list of troops the party has taken prisoner (if they have no prisoners this section will not be displayed). If you have a character who knows Tracking you will see arrows appear on the world map to represent tracks left by parties (including your own). The direction they point indicates the direction parties have taken on the map, and, at higher skill levels, the approximate party size. 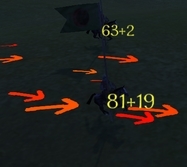 At higher skill levels the arrows will also be colored to represent the time since the passage of the party. Your visibility on the map is limited; while locations are always visible, parties disappear after they go a certain distance away from you. You can increase the distance at which you can see other parties by increasing your Spotting skill. Visibility is lower at night than it is during the day, and parties also move slower. When two or more hostile parties clash with each other they will stand adjacent with a recognisable crossed swords symbol over their heads. You will also hear the sounds of battle when you are close by. If one of the parties is an enemy you can jump into the battle to help the other party. If you are neutral to or an enemy of both factions you cannot join the battle. As time goes by the parties' forces will be wounded or killed, and then the one that is losing will either flee from their attackers or will be utterly destroyed (any survivors will be taken prisoner). If you destroy a hostile force that has prisoners you can rescue them and optionally add them to your own party (see Party for more information). 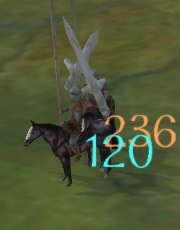 Once you have encountered a hostile force you will be faced with a menu showing the party sizes and giving you the combat options "Charge the enemy" and "Order your men to engage the enemy while you stay back". 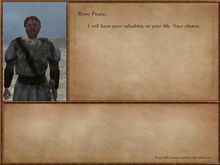 If you were the one chasing the hostile party you will see a "Leave" option at the bottom, which lets you flee the battle without any negative consequences. If they were chasing you you will instead see a "Surrender" option, which makes you lose all your men and some of your gold and equipment. By fighting well you can earn the "Leave" option regardless of which party was the aggressor. Combat takes place in rounds, with the battle size setting determining the total number of rounds (see Configuration for details). At the end of each round you will see details of what men were killed or wounded on each side, as well as some menu options depending on the situation. If it is the last round of battle the next screen will let you take prisoners and recruit the enemy's prisoners into your party, and the screen after that will let you select loot from the fallen to place in your own inventory. You and your men will also earn some experience and gold, and if the force you defeated was larger than your own you will earn some Renown. Renown represents your fame, and is central to your relations with the factions in the game. It is earned by displaying valor in battle. The more Renown you have the bigger your party can be. 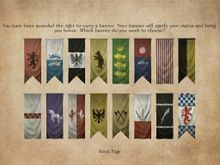 Once you reach 130-160 Renown you can join a faction, and will be awarded the right to bear a banner (which will fly above your party and any towns and castles you own). Increasing your Renown also makes your king more likely to grant you a fief after a successful siege. You can view your current Renown by clicking on Reports and then choosing Character report. If you go for a week without doing anything that affects Renown, it will decrease by 0.5% of its current value. 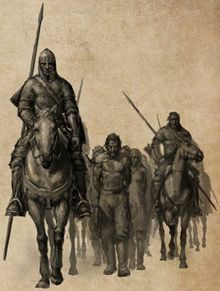 If your army is totally defeated in battle (or you surrender) you and all your men will be taken prisoner. After being moved around for a while you and your companions will automatically escape, but your troops will still be held captive and some of your items will be missing. If you wish to you can hunt down the party that captured you to get your men and some of your gear back. If you are caught when trying to sneak into an enemy town you have the option of fighting or surrendering. If you surrender or choose to fight but are defeated you will be put in prison to pay for your crimes, but unlike a military defeat your men will not be taken captive and your equipment won't be touched. During your imprisonment your captors will demand money before they set you free, and you can either pay this or wait for a better opportunity. You still have to pay your men their weekly wages while you are in prison, so take this into consideration if you wait to pay the fine. This page was last edited on 19 June 2011, at 03:58. This page has been accessed 110,192 times.